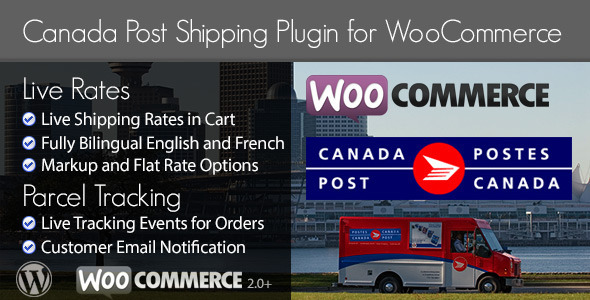 This Canada Post Shipping Plugin for WooCommerce provides integration withCanada Post and your WooCommerce website. It is able to provide live shipping rates directly to your customers in their shopping cart and at checkout. Also, it provides up-to-date package information from Canada Post’s Parcel Tracking service. This plugin is fully bilingual in English and Français (French) and is compatible with WPML, a multilingual plugin for WordPress. It can be used to ship with in Canada as well as Worldwide. Package Tracking is available when you enter the PIN (Parcel Identification Number) or Tracking Number into the customers order details. This plugin will automatically look up the most recent and up to date event information available for your order from Canada Post, when you view the order. You can set an automatic email notification to be sent to your customer when the package is mailed or delivered. The tracking information can be set to allow your customer to receive up to date information on their order either as an email notification and/or at your customer order page. You are able to choose which services from Canada Post you want to offer your customer (ie. Regular mail, Xpresspost, Expedited, etc). There is also an option available to add additional handling time if needed. The shipping charges will be calculated and displayed using current and live rates directly from Canada Post. An additional feature gives you the option to set up Lettermail; which gives you the ability you to set a flat rate for regular post items that are small enough to be delivered with Canada Post Lettermail within Canada or the US. In addition this feature can be set for flat rate shipping for sales or promotions. Shipping rates and information from Canada Post can be shown in English or Français (French). This is set by your WordPress installation or WPML language selection. The plugin includes a language file for French (fr_FR), which provides full French translation for all admin screens and labels. Note: Support communication and documentation is currently only in English. This entry was posted in eCommerce, Shipping, WooCommerce and tagged canada post, ecommerce, integration, package, parcel, postal, rates, shipping, shipping plugin, tracking, woocommerce, wordpress on July 22, 2015 by Vera Jaman. 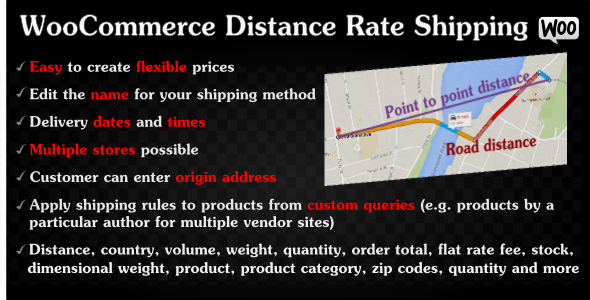 Distance Delivery Costs This plugin has distance as a variable in shipping cost calculations so you can charge for the distance of the delivery. Flexible Rules This plugin is made up of rules so you can e.g. change the name of the shipping depending on which shipping cost applies to the customer (e.g. the customer can see the shipping charged as “Free Delivery” if the customer is within 5 miles). Versatile Query Conditions You can use queries to make up any shipping condition you like (e.g. for products with certain attributes or custom fields). Loads of options This plugin has lots of options so that you can even ship frommultiple stores or let the customer choose delivery dates/times. Lots of Variables This plugin has lots of variables like distance, country, volume, weight, quantity, order total, flat rate fee, dimensional weight, stock, product and product category for creating table shipping rates. stores that need flexible shipping conditions. 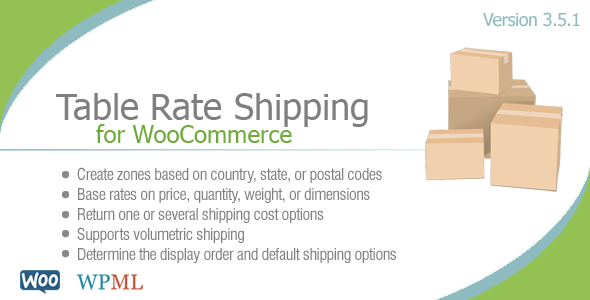 This entry was posted in eCommerce, Shipping, WooCommerce and tagged delivery, delivery costs, ecommerce, ecommerce plugin, international shipping, plugin, shipping, shipping costs, shipping method, shipping plugin, shipping rate, woocommerce, woocommerce delivery costs, woocommerce plugin, woocommerce shipping on July 2, 2015 by Vera Jaman. Due to a necessary restructuring of files in this plugin, you will need to manually reactivate the plugin after uploading the new version to your server. Also included in this update is the BETA release of the Bolder Elements plugin manager. It gives you the ability to register any and all license codes for Bolder Elements plugins, however at this time automatic updates is only available for this plugin (Cart Based Shipping for WooCommerce). All feedback, concerns, and suggestions are encouraged. Cart Based shipping allows you to set different shipping rates based on the items a customer has in their cart. There are three calculation methods: by the subtotal price, by the number of items in the cart, and by weight. For example, the higher the subtotal or weight of the cart, or the more items a customer is purchasing, the higher the shipping rate may be. You may also set this feature to be available only to certain countries. The WooCommerce Cart Based Shipping plugin works alongside your WooCommerce store by adding a new shipping method directly to your WooCommerce settings. The familiar layout and easy to use options will make it simple to setup and use in your store. This plugin is designed to work with the open-source WooCommerce plugin. 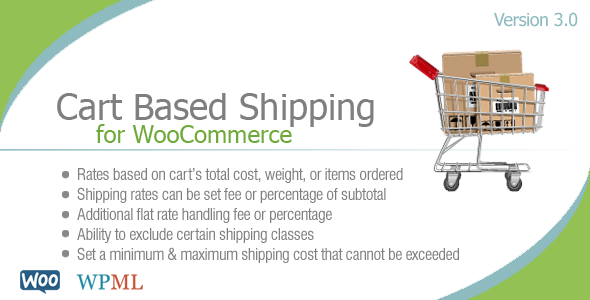 Base your shipping costs on the cart’s subtotal, number of items ordered, or total weight of all items combined. This entry was posted in eCommerce, Shipping, WooCommerce and tagged cart, ecommerce, item count, plugin, shipping, subtotal, weight, woocommerce, wordpress on June 6, 2015 by Vera Jaman. 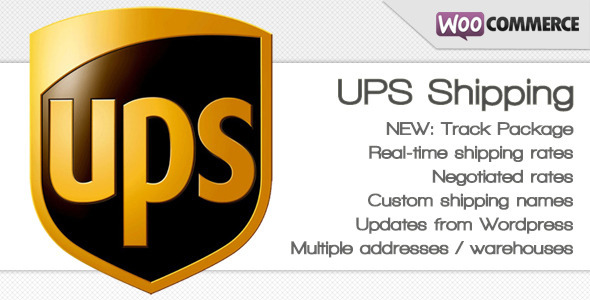 Ship using your negotiated rate for UPS. Auto update, future updates will be available directly from WordPress interfaceFREE. This entry was posted in eCommerce, Shipping, WooCommerce and tagged ecommerce, method, shipping, tracking, ups, woocommerce on May 30, 2015 by Vera Jaman. This entry was posted in eCommerce, Shipping, WooCommerce and tagged cart, ecommerce, item count, plugin, shipping, subtotal, weight, woocommerce, wordpress on May 13, 2015 by Vera Jaman. Not using WooCommerce? This plugin is also available for JigoShop. This entry was posted in eCommerce, Shipping, WooCommerce and tagged bulk, bundle, dimensions, ecommerce, per class, per item, per order, per weight, shipping, table rate, volumetric, woocommerce, wordpress on March 17, 2015 by Vera Jaman.